There would be no great leaders without great crises. If such leaders had lived in times of peace, no one would have known their names. The same is true of the Venerable Maduluwave Sobitha. Our nation is bereaved. The entire country seems helpless because of our loss of him. But we are in a better situation today because Ven. Sobitha passed our way, because he provided leadership to democratic forces at a crucial time in Sri Lanka’s political history. His vision, character, and perseverance enabled him to carve out for us a democratic space within the shoals of treacherous seas that encompassed the country’s political culture during the UPFA regime. He provided leadership for citizen movements at a time when many thought democracy was dead and buried and change would not be possible through peaceful means. Unfortunately for us Sri Lankans, we lost the reverend at a critical moment, when we needed his services to prevent the current regime from abusing the democratic space he helped carve out and from allowing that space to be colonized by the political culture of the previous regime. With Ven. 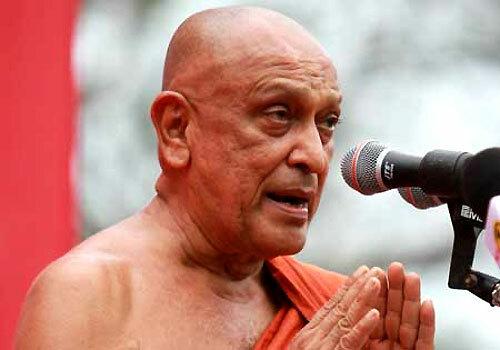 Sobitha’s death, Sri Lanka lost one of its great religious leaders. He was a rare visionary. His vision was a moral one driven by his convictions of Dhamma. What motivated him in his valiant efforts to advocate for political reforms was the belief that one day Sri Lanka would be a better place. With absolute faith in the power of the citizens to bring about reforms based on moral principles, he allowed no political party to proselytize to him. Inflexible in his principles, he allowed no party to use him. Content with the support of concerned citizens of all religious and racial groups, he did not seek political patronage in ways that would contradict his quest for democratic reforms. In the death of Ven. Sobitha, we behold a great life ended, a great purpose achieved, an exemplary life lived, and a great model of commitment for social justice nobly established. For our own good and the good of those who come after us, we cannot let Ven. Sobitha’s example disappear from memory. Rev. Sobitha did not bewail his hardships, exult over his triumphs, or become discouraged by setbacks. His singular purpose was to mobilize citizen support for political reforms, at a time when the other prominent religious leaders, intellectuals, and politicians were complicit with abuses of state power. Until his death Ven. Sobitha stayed focused on his mission for democratic reforms. He did not allow the disappointments to distract him from that mission. Now that Ven. Sobitha has departed this earth, as we all will, let us guard the memory of his contribution to Sri Lankan society as a precious inheritance, let us continue to teach our children the story of his life, let us try to imitate his steadfastness for social justice, and let us endeavor as he did to leave the world freer and more just than we found it. While Ven. Sobitha’s death is an occasion of deep sorrow, it should also be one of celebration and dedication. We must possess the resolve to unite and continue to work, as Ven. Sobitha did, for a more just, equal, and peaceful Sri Lanka. The best way we can honor Ven. Sobitha is to be active citizens to ensure that his vision for a just society will not be abused by the leaders of this country. We must not allow unscrupulous politicians to make political capital by shedding crocodile tears and eulogizing Ven. Sobitha’s death! Perhaps, people must send a strong message to the government by allowing only the colleagues of Ven. Sobitha, and the members of his family and Citizens Movement for Social Justice to lead the final rites of his funeral. I also admire Ven. Sobitha for the changes of his political views relating to the ethnic issue from 1980s to the Present. He showed the courage and humility to change. During 1980s he was a member of the Chintana Parshadaya, along with Professor Nalin De Silva. He was also an active member of the Sinhala Bala Mandalya and Mawbima Beraganime Sanvidanaya. In fact, I think Ven. Sobitha’s picture was in the cover page of Prof. S.J. Tambaih’s book Buddhism Betrayed? (This book was widely misinterpreted by Sinhala nationalists as an insult to Budhism and was banned in Sri Lanka). Since mid-1990s Ven. Sobitha distanced themselves from these nationalist movements and began to focus on democratic political reforms. In several occasions he was critical of the war and advocated the need for constitutional changes to address the ethnic issue. These changes earned him the wrath of the extremist nationalist forces who accused him of being a traitor and a friend of the bad friends/foreign powers! These nationalists’ even refused to recognize his leadership qualities and argued that leadership was imposed on him by the foreign powers, and he did not have leadership skills. We must also recognize that Ven. Sobitha’s campaign for democracy helped to create a space for the government to address the war crimes and political devolution issues. I think Professor, Tambaih’s book was a recognition and a tribute to the service rendered by Ven. Sobitha. Destruction of democracy and justice by the leaders of the country with the patronage of religions was indeed an act of betrayal of Buddhism. Ven. 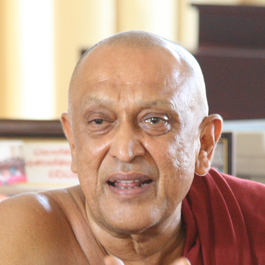 Sobitha’s reform activities were evidence of his opposition to such betrayal of Buddhism for political advantage, and he tried to restore Buddhism to its right place. You are absolutely right, Jude and your assessment of Prof. Tambiah’s book is also correct though some misguided elements had misinterpreted the book and especially its cover page! I think the book and the cover page is a tribute to Buddhism, if read in the light of teachings of Buddha or any religion, rather than ethnoreligious nationalism. I had this discussion about 12 years ago with Prof. Thambiah. Why you have not included your response in the main article. Was it an after thought? or you thought this response would have distorted the main thrust of your article. Thanks. Yes, I had the comment as a foot note and for some reason it disappeared. I think my comment strengthens the main thrust of the article. We all are born into anti-democratic cultures. But I admire people who change for the better. That said, I also do not know of any direct involvement of Rev. Sobitha in support of rights of the Tamil Community. I would have loved to see that. Well.. that is a another story.